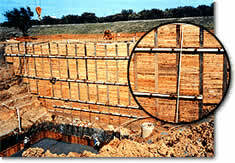 A pre-engineered tieback system for earth retention supplied by A.B. CHANCE Company simplifies the challenges for contractors. These tieback anchors are installed by rotating the anchors into the ground with common rotary drilling equipment. Capacities to 200,000 pounds per anchor are obtainable with this system. Proven on hundreds of applications these cost effective tiebacks can be tested immediately. No concrete to wait for curing! This saves time and money plus improves schedules. Vickars Developments field personnel can show you the advantages on specific applications. Installed anchors can be proof-tested immediately -- no waiting for grout to cure. Install in almost any weather, with conventional drilling equipment. No concrete trucks or grout pumps required. Predictable holding strength in all soils. The success of the screw anchor tieback system is based on decades of similar use of CHANCE® anchors by electric utilities. The proven reliability and engineered predictability of the system's performance gives you tiebacks that are positive, economical and hassle-free.